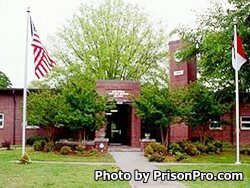 North Carolina Correctional Institution for Women is located in Raleigh North Carolina, part of Wake County. It is a mixed custody women's facility that houses minimum, medium, and close custody inmates. It is the largest correctional facility for women in the state of North Carolina and has a current capacity of 1,288 inmates. This is the facility that female inmates on Death Row are held. All offenders are given necessary medical, dental, mental, alcohol and substance abuse treatment. North Carolina Correctional Institution for Women also serves as an intake facility for all women who have been committed of felonies. The intake process consists of multiple physical and mental evaluations, and will determine the programs, treatment, and housing location of the offender. North Carolina Correctional Institution for Women operates two Correctional Enterprise programs, a license plate manufacturing facility, and a duplicating and quick copy plant. Additionally, inmates can work in an upholstery shop and in various support services within the prison including custodial and food services. Offenders can also receive educational training to earn a GED while incarcerated and participate in vocational training in culinary arts, cosmetology, office technology, and horticulture. The Visitation procedure will require your family to call and schedule an appointment. Visitation appointments must be made by calling (919) 508-1501 or (919) 508-1502, Monday thru Friday between the hours of 7:30 am and 4:30 pm. NO VISITING OR SCHEDULING of appointments on Holidays.